In this vegan version of creamed spinach, you get the goodness of tofu instead of the bother of cooking a flour-thickened milk sauce. Easy and quick, it’s a feast for spinach fans! Photos by Evan Atlas. 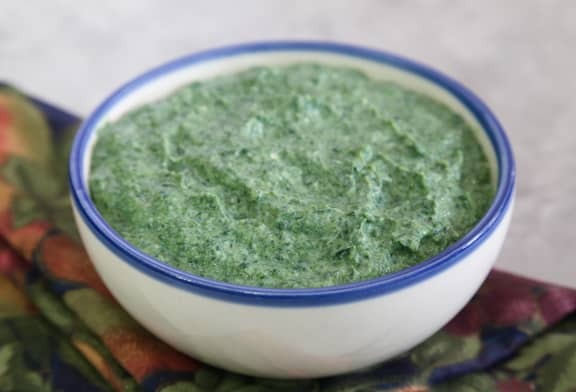 You can also see a step-by-step of this recipe at How to Make Delicious Dairy-Free Creamed Spinach. Here’s more —Healthy, Versatile Spinach: 10 Tasty Recipes. The traditional non-vegan style creamed spinach that I am used to is was simply a rue made with butter, milk and a small amount of flour. Then the drained frozen spinach along with some freshly grated onion was added and cooked until hot. S&P to taste of course. Some recipes were even then put under the broiler to melt come kind of cheese. 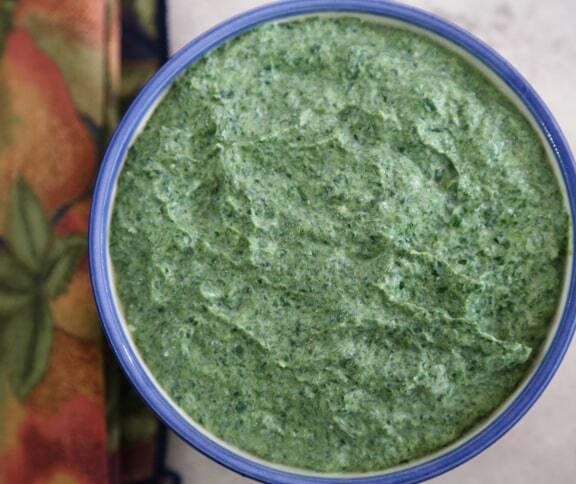 And as much as I do love cheese, I can easily do without it for creamed spinach. I guess my question is, since I am new to the vegan world and will never be 100% vegan, but am trying to switch over as many things as I can….why modify the basic recipe so much? A basic rue can be made using non-dairy milk, Earth Balance and a flour of your choice….why the tofu? And good God, why do some many vegan recipes that I see have dill included in them….the one herb that I cannot stomach the taste of…vegan or non-vegan. Minus the dill and substitute a small amount of grated onion, I’m sure the above recipe would taste great, but why not use what most vegans and semi-vegans already have on hand instead of going out to specifically buy silken tofu….which is fairly expensive in my area….and I already have almond milk and Earth balance at home? Hi Melody, you can certainly veganize a standard creamed spinach recipe by making a standard roux — but I just love the silken tofu as you don’t have to worry about lumping, and whether the roux will be thick enough, etc. — it purees to just the right texture. Of course, you can omit the dill or substitute a little parsley or basil.